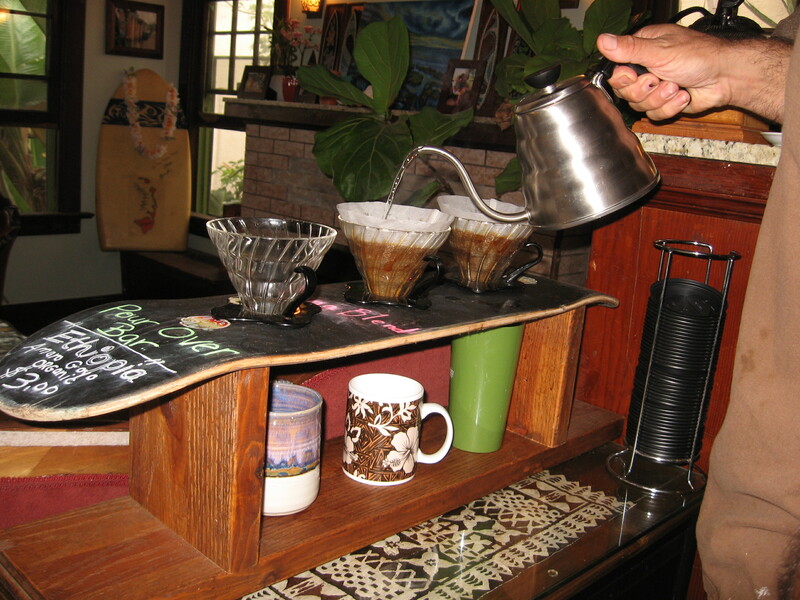 Pour over using a skateboard. The owners of Te Mana greet me by name and who doesn’t love walking into a coffee shop & being greeted by name? That’s just one of the many reasons I love Te Mana. Of course there’s the coffee, which is really why I go there, after all. Their Ethiopian pour over is outstanding, but it’s also fun to watch the process as their pour over is on an upside down skateboard (see photo). Their Dirty Chai doesn’t sound like a coffee drink, but it’s a mix of espresso with chai & milk. It didn’t sound good to me, but it’s amazing! It feels like home here, but maybe that’s because it is a home…a 1924 Craftsman home where the owners raised their family. Since I can’t afford a beach Craftsman, I can at least sip coffee on their porch & pretend it’s mine. Or if it’s cold (which it isn’t very often) I can sit by their fireplace in a comfy chair. Besides coffee & tea they have some interesting Hawaiian food specialties. But most important, they greet me by name with a smile. So what does their name mean? Ask them, it’s a Hawaiian thing that I didn’t understand. Closed Wednesdays. Summer update: Their ice coffees are iced with frozen coffee ice cubes so your coffee isn’t diluted as the ice melts. Now why didn’t I think of that? 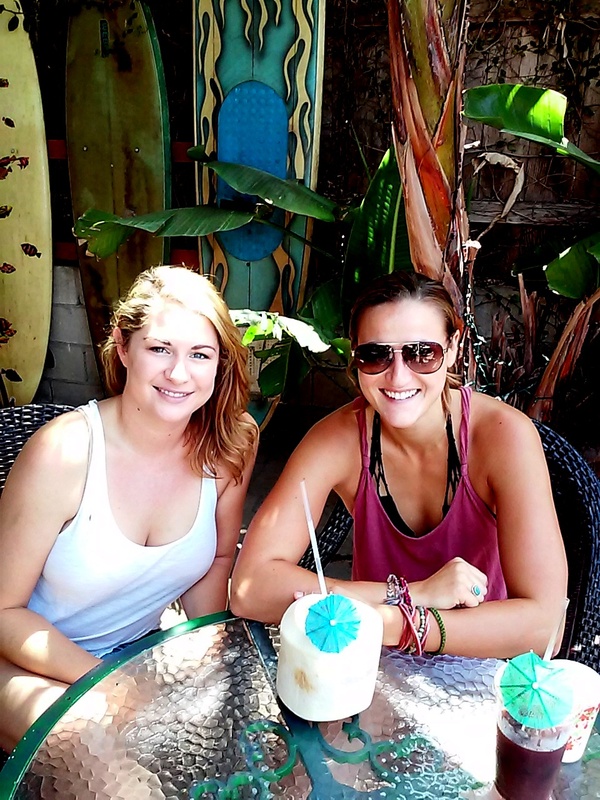 Amanda & Kelly enjoy a chilled coconut while I enjoy my iced coffee. Beer tasting the 3rd Tues. of every month from 4-6:00pm. Music Saturdays from 2-8:00pm, open mic Sundays from 3-5:00pm. This entry was posted in Coffee shops in San Diego, music, near the beach and tagged Hawaiian coffee, Ocean Beach, pour over. Bookmark the permalink.